In 2011 I was invited by the South African novelist Jeanette Ferreira to write a short story for a new Afrikaans anthology about the Anglo-Boer War which she had been commissioned to compile by the publishers Tafelberg. I hadn’t written a short story since 1965 (I was 22) when “The Man who Went Far” was published in the Cape Times Weekend Magazine, so my first response was to say No. Jeanette easily demolished my feeble excuses, agreeing that I should write it in English and that she would translate it into Afrikaans, the language of the anthology. The requirement was to write a story no longer than 3,500 words. I started out with the best of intentions but, having become more accustomed to writing novels, I found that keeping it short was quite difficult. When it was finished it was about 6,600 words long, almost double the required length, and entitled “The Twins”. I sent it off with an apology but didn’t get away with it. As Jeanette was translating it, she also had the opportunity to edit the text, which she did with great skill. The whole consultative translation process was fascinating, and new to me, and in the end there was a short story in Afrikaans (which I can read and speak with reasonable fluency, but lack the ability to write skilfully) called “Die Tweeling”, about 4,500 words long – a compromise acceptable to both author and editor. The story as it appears in the anthology contains all the essentials of my original story, and is admirably concise. I can’t say that my original story is better, but I quite liked the additional elements that were squeezed out by the exigencies of editing and publishing, so I am taking this opportunity of offering it to English-speaking readers in its original form. The anthology isn’t illustrated, apart from the cover, but I am including a picture of the protagonist Lizzie, as I imagine her. Before writing the story I did a bit of research about the period and looked at a number of photographs. Among these was a group photo of some Boer women in their Sunday best, and one of them looked to me like Lizzie. Although slightly embarrassing to be one of those singled out in this way, I admit that I did experience a small glow of satisfaction, especially as short story writing is not really my metier. I should also add quickly that the future which Cecile Cilliers mentions is the future as seen from 1902, and that the “terrifying glimpse” that the reviewer saw is, thankfully, now also in the past. I do want to clear up one other issue before you read the story, and that is the use of a word which is today rightly considered offensive. I included it because it was current at the time of the story and I believe that it adds to the story’s authenticity. I am sure that readers will understand and not be offended. 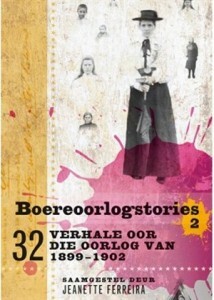 I have also included a glossary of South African words with which some readers might not be familiar. So please click here to read “The Twins” in its original, unpublished form.